Choosing a college is an important step to ensure financial stability in your future. Check out college rankings by graduate salary in Kansas. 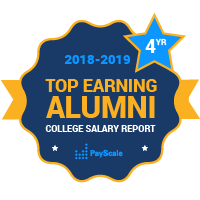 This list provides data on the best four-year colleges in the sunflower State by earning potential, identifying which colleges will get you the highest salary after graduation. If you’re looking for the highest paid college graduates in Kansas, then you’ll want to take a look at Kansas State University, Southwestern College and University of Kansas. These schools, by a fairly wide margin, present the best salary prospects for Kansas Graduates with limited-to-no career experience, as well as down the line with media career salaries. Both the University of Kansas and KSU are state schools, with Division 1 football and basketball teams. In addition, about 85 percent of students would recommend these two schools. That is only exceeded in Kansas by Fort Hays State University, where about 90 percent of alumni recommend their college experience. Kansas leads the nation in wheat production, and Wichita is the one of the nation’s top plane manufacturing cities. Logically, top employment industries for college graduates in Kansas include aerospace, transportation equipment, agriculture and commercial and private aircraft.